Written to provoke thought and generate discussion. Perfect for Bible studies, women's, marriage and youth groups! Choices are inevitable. Even refusing to choose is a decision in itself. From the time we are toddlers through adulthood, our choices produce consequences in our lives. 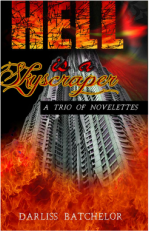 Hell is a Skyscraper: A Trio of Novelettes follows Demetri, Egypt and Chriselle as they journey to make choices for the dilemmas they face. Teenaged Egypt is a high school senior and gifted student with a dream to become a journalist. Her mother’s irresponsibility as a parent forces Egypt to sacrifice her young life in ways she shouldn’t have to. When Egypt faces a choice between family and her dream, which will win out? Will Egypt reach for her dream or remain stuck in her current lifestyle? Chriselle is a woman staring at an empty nest. Her once busy household has become a center of loneliness and boredom. When Chriselle unexpectedly reunites with a former love, he brings the opportunity for the exciting lifestyle she desires. Suddenly, Chriselle realizes her heart beats not just for her husband but also for her almost-fiancé. Will Chriselle stay “safe” with her husband or move on to live the life she desires with her former boyfriend? Demetri is a young boy living with a terrible secret. When his mother dies unexpectedly, the level of trouble young Demetri experiences grows exponentially. Just when he thinks things can’t get any worse, his father chooses a new wife whose identity shocks the family and adds to the chaos. Betrayed by family members, Demetri learns that no matter how bad things get, they can and often do get worse. Can Demetri ever forgive those who have hurt him? Hell is a Skyscraper: A Trio of Novelettes seeks to challenge the reader’s ideas on the themes of dreams, forgiveness and marriage. What would you choose to do?